And on to the eats!! In a medium saucepan, spray oil and sauté garlic. Add chiles, chili powder, cumin, chicken broth, tomato sauce, salt and pepper. Bring to a boil. Reduce the heat to low and simmer for 5-10 minutes. Set aside until ready to use. Spray a 13 by 9-inch glass baking dish with non-stick spray. Put 1/4th chicken mixture into each tortilla and roll it. Place on baking dish seam side down. Top with sauce and cheese. Cover with aluminum foil and bake in the oven on the middle rack for 20-25 minutes. Top with low fat sour cream or scallions if you wish (not included in nutrition information). Makes 8 4 enchiladas. Diabetes is a serious and costly health problem with fatal complications when uncontrolled. Diabetes is the 6th leading cause of death in the US and is the result of too much sugar (i.e. glucose) in the blood. While glucose is the main source of energy in the body, elevated levels in the blood can lead to serious damage and complications such as blindness, amputations, kidney failure, and death. Because diabetes is a disease so hugely dependent upon diet and lifestyle changes, it makes working in this field very rewarding. Once a patient can understand what foods do for THEM in controlling their disease, my mission is a success. Diabetes is a highly individualized and intricate disease with lots of emphasis on prevention. Question #1: Do you know someone with diabetes? Type 1 or Type 2? Have you ever tested your blood glucose? « Happy National Registered Dietitian Day! I love me some enchiladas! I can’t believe these are so low calorie. They look SO tasty. Happy belated RD day! I’m glad to hear you enjoyed it. You do so much to raise awareness about how to be both healthy and happy that you deserve it! Sigh. Diabetes. The bubonic plague of the twenty-first century. I am definitely making those enchiladas! Using a homemade sauce is so much better, especially because then you can control the heat. I’m on my way home for dinner. It will be nothing so delicious as those enchiladas :). Oh my goodness, those homemade enchiladas look so good! Diabetes really scares me…great info, as always. My grandfather had diabetes. He never let it slow him down–mostly because he didn’t learn about it until he was 75 and didn’t care by that point–but it’s something that worried me at a young age and made me get healthier. I don’t even think I’ve had enchiladas made for me let alone make for myself. My grandmother had type II and my mother-in-law has gestational. This may be an ignorant question, but can you get type II diabetes if you have type I? Not an ignorant question at all! If you have type 1 diabetes you cannot get type 2…but if you have/had gestational diabetes you CAN get type 2 diabetes. My brother was borderline diabetic and he cut out his sugar and ended up just fine. My dad and my grandfather both had diabetes though. No I have never made enchiladas-they seem difficult to me! My mom was diagnosed with type 2 a while back. It bothers me because that comes from lifestyle and could be fixed with changes to your life. I don’t know anyone with diabetes and I’ll be meeting with my doctor on the 23rd to go over my blood and urine tests which blood glucose was one of the things they are checking. Based on your symptom list I should be fine. Based on your risk list I am glad I’m getting myself back into shape! 1. Enchiladas are my favorite things to order at Mexican restaurants, but I’ve never made them at home. Every recipe seemed so bad for you. But THESE look amazing…bookmarked! My mom has type two. She could definitely benefit from seeing a nutritionist but is very stubborn about her diet. It’s frustrating! My parents are best friends with a couple, and the husband has diabetes. He is so incredible at managing it. He eats so well, maintains a very healthy weight, and is very aware of everything he eats. My parents say in over 40 years of knowing him, they have only seen him have one glass of alcohol ever! He takes such good care of himself! Enchiladas! I should make some veggie enchiladas soon! I’ve never ever had or made enchiladas, isn’t that sad?? I should change that asap. Not fair for me to answer the questions since that is along the lines of my “specialty” too, but again, never got the hours before I moved overseas, so no exam for me, oh well. Thanks for sharing with everyone all the great info, including the bit on not low carb, but consistent carb diet. Some people think get rid of carbs, get rid of diabetes. Too bad it doesn’t work that way. Enchiladas are my favorite!!!! These look great! I love enchiladas – I have a recipe for black bean chili enchiladas that is delicious. Thank you for the information on diabetes – my mom has Type 1 diabetes although she developed it in her mid 20s. I try to maintain a healthy weight and exercise to prevent developing diabetes since I know I have a higher risk. Everyone on my dad’s side of the family over 50 has diabetes and most of my mom’s side gets it after they turn 65. My mother-in-law was just diagnosed with it two weeks ago as well. The summer before my senior year in high school my grandpa passed away from complications from his diabetes because he didn’t take it seriously and take care of himself and he couldn’t get proper medical care once it reached a critical point. It was heartbreaking to know that if he had taken steps to prevent it he might still be here. Diabetes scares me so badly. It’s a huge reason for my exercise, weight loss and nutrition goals. My paternal grandparents both had diabetes and my father has type 2. The only risk factor that I have is family history but I’m still worried about it. I got tested maybe 3-4 years ago and my blood sugar was fine. It’s hard not to know someone with diabetes. I hope we can change this fact soon…I came home for the week and had the pleasure of eating my mom’s homemade vegetarian burritos. Probably one of my favorite things she makes. Her recipe is pretty intensive, so not something I would normally make on my own, but it turns out wonderful! ive never made home made enchiladas but you may have just inspired me!!! Ive never made homemade enchiladas but these look DELICIOUS!!!!! My maternal grandma has type 2. She lived with it without needing any medication for a long time, and recently had to watch her diet closer. Not easy to do with a stubborn German 85 year old! Enchiladas are one of the recipes my husband requests most! We have only made them a handful of times – mostly because the recipes I have used make so many and aren’t exactly healthy 🙂 So thanks for the recipe! My mom, maternal grandpa, aunt and uncle all have Type 2. 🙁 I’ve actually had quite a few friends diagnosed with Type 1.5 recently, as well. One actually suggested I get tested, because I seriously drink over 150 oz. of water a day and am STILL always thirsty. Like, every second of the day! I don’t know much about the rest of the symptoms, though. I’m copying and pasting that recipe right now! I’ve only made enchiladas a few times – actually, there are some turkey enchiladas I’ve made that are pretty tasty! What kind of carbs should a diabetic eat? Sarah, good question. A diabetic can eat all carbs, but should have an emphasis on complex carbs (those with fiber like fruits, vegetables, legumes, and whole grains) — just like a non-diabetic. Most people and diabetics think that if too many carbs are bad, the less carbs they eat…the better. And that’s not the case. An adult body requires at least 130 grams of carbohydrate a day for proper functioning (things like the brain need glucose — they can’t use anything else for energy). Plus, the liver produces glucose when carbohydrate intake is insufficient or inconsistent. This is why a carbohydrate controlled diet (meaning amount and timing of the carbohydrate) is so important. Thanks for answering my question so quickly. I have another one for you. What should someone do if they think they might have Type 2 diabetes because they have it in their family history and also have one of the symptoms (frequent urination) but they don’t have health insurance so they can’t go get a blood test. Is there another way to find out? No problem! I would go to a local drugstore and purchase a glucometer which comes with several testing strips. Have the person test their blood first thing in the morning before eating or drinking anything. If that number is between 100 and 125, they are “pre-diabetic” — if it is 126 or higher, they are diabetic (diagnosis has to be made by a medical provider, but this is national standard by the American Diabetes Association). They should recheck for a day or two, first thing in the morning. If the blood checks come back >100, they should seek medical attention even if they are not insured. Early detection is so important. The enchiladas look fab. I love Gina’s recipes! Thanks for the info on Diabetes, it runs in my family, which is most of my reasoning for eating very healthy. I know a bunch of people with diabetes. Most of them dont take it seriously enough either. That really, really bothers me. I know two people with diabetes, both type 2. Yes, my sweet husband has had Type 1 Diabetes since he was 14. He’s pretty good at controlling it, but his A1C is not where it should be right now. Also, his vitamin D is too low, probably from having celiac. But you know what’s so amazing… my man NEVER ever complains. He’s pretty incredible. I love those enchiladas! I’ve never tried making them before, but perhaps I should! And I know many people with diabetes. It seems like it’s just so common now. 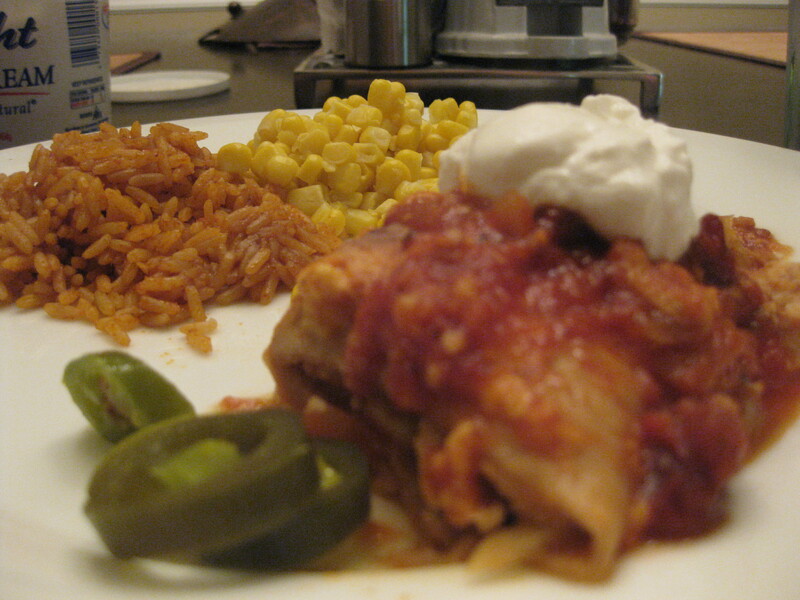 Mmm, now I’m craving Mexican – your enchiladas sound so good with all those tasty spices! This is my first time visiting your blog 🙂 Though I love eatin’ enchiladas I have never made any!! 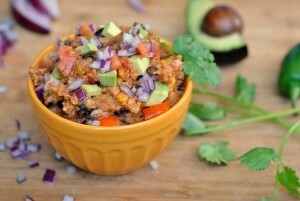 Great and healthy recipe, I will be making some soon. I know so many people at my work with diabetes. Diabetes and depression are the 2 major health issues that are driving up our health insurance costs up. I’m very excited that I get to be one of the leaders in our new wellness plan that will focus on prevention, with an emphasis on those 2 issues. Homemade enchiladas with homemade sauce rocks, much better flavor and better for you than store bought. No and yes. I am forwarding you blog to the person I know who has diabetes. First time at you blog. It is very interesting. I am going to try a couple of the recipes (calamari! and coconut tofu!). Thank you for visiting my blog and your lovely comments. Chicken enchiladas always seem to hit the spot! I used to make the red sauced ones all the time, but once I started making the white enchilada sauce, I can’t go back!